People searching for new information on Titanic can be very specific in what element of the story they are interested in. Some are looking for technical and design information; Others want to see new photos of the ship. The history of the three sisters Olympic, Titanic and Britannic continues to fascinate researchers. Lastly, a book focusing on the passengers and crew will draw people to the human side of the story. 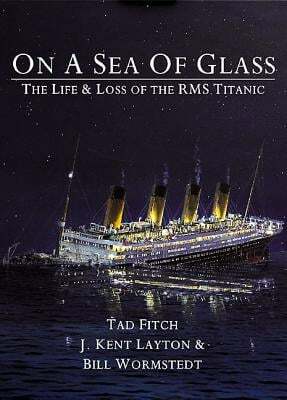 On a Sea of Glass is a comprehensive book for those interested in every aspect of the lost liner. The introduction by historian and author George Behe sets the tone of what to expect from Tad Fitch, J. Kent Layton and Bill Wormstedt: an authoritative text, crystal clear photos, and a wealth of new information. A glance at the table of contents shows that every facet of the Titanic's story is explored in close detail. No book should try to match Walter Lord's narrative, but this book has an intimate quality to it. The reader can imagine themselves mingling with an interesting cast of characters. Whether walking with Joseph Bell, the future chief engineer of Olympic and Titanic, through the Harland and Wolff yards or trying to find your way around Titanic with Charles Lightoller. There's the sad letter David Blair writes aboard the docked Titanic about how he would not be making the maiden voyage. Various lookouts asked officers repeatedly during the voyage for a pair of binoculars. The request was never denied, just the assurance they would get them 'later'. It's easy to sense the frustration coming from George Hogg and George Symons on this subject. It feels like eavesdropping to be in line at the pursers desk when Eleanor Cassebeer carelessly makes an anti-Semitic remark to the Jewish Ben Foreman; sitting in a chilly lounge with Philipp Mock as a steward told passengers they were nearing ice; when William Silvey slips an apple into the pocket of his wife's coat as they are preparing to evacuate. The appendices examine myths, misinformation and dangling questions on a variety subjects. Take, for instance, the chapter on the candidates for an apparent suicide during the final minutes. All possibilities are shown through a skeptic's eye and with the evidence skillfully presented, it allows the reader to come to their own conclusion. Other sections cover whether or not binoculars would have made a difference, Thomas Andrews final movements, and the factors dealing with Titanic breaking apart, among other questions readers might have. The authors use mostly first person accounts to illustrate their arguments. Charts and diagrams help illustrate their points. It's clear, by reading the end notes, that the three authors didn't rely on just the usual sources for information. That is a trap many people writing about the ship fall into. Hence why so many Titanic books are interchangeable. On a Sea of Glass is different. Many of the sources the reader sees will not be found in other books. Each page reveals a new fact, story, anecdote. It also shows a collaborative effort between the authors, other researchers, and descendants of Titanic families. A book this size may have some minor grammatical errors, or a mis-caption or two, but overall most things appear to be checked and double checked. There have been a number of excellent books that are coming out, or have come out to coincide with the 100th anniversary of Titanic's sinking. This is one book that everyone interested in the ship must have. Fellow researchers will regard this as a definitive source to be consulted on the subject and readers will no doubt consider this book a favorite in their collection. Join the "On A Sea of Glass: The Life & Loss of the RMS Titanic" discussion on our message board, 107 posts, last post by Brad Rousse.